Escada has launched Miami Blossom, the brand's limited edition summer fragrance for 2019. Last year's model was Sorbetto Rosso. Escada Miami Blossom EdP is an exuberant, fresh scent. A refreshing, colorful cocktail that brings your thoughts to sweet summer days. It breathes energy, lightness and juiciness, where the perfumer Caroline Sabas selected the classic summer fruit pineapple as the main ingredient. 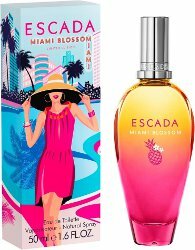 Escada Miami Blossom EdP opens up with notes of watermelon, blueberry and fresh orange that then turn into a juicy heart of pineapple, jasmine, tiare, tuberose and spritz where the pineapple is really highlighted. In the base we find notes of sandalwood, ambroxian and sandalwood [sic] that complete the fragrance. Escada Miami Blossom is available in 30, 50 and 100 ml Eau de Toilette. I’m almost inclined to buy this. I’m sure it will be cheerful and uncomplicated and life is mostly neither. Yes…if it’s a decent pineapple it will be tempting. Then again I still have Ananas Fizz left. I see this bottle, and all I can think is I can’t wait until spring! I’m a sucker for these. Eeeeeeevry year. Taj Sunset (2011) is my fave from them so far. I have two bottles of Rockin’ Rio, acquired before I became a real perfumista, I still really love them. Hmmm, already saw this at TJMaxx. I like pineapple as a note, so will have to look for it wherever it may be. I see the pineapple on the bottle and like that, too.